The ASQ Pittsburgh Plant Tour!! - 50 person MAX (2 groups of 25 attendees) We have Headsets for the attendees to be able to hear the Tour Guide. Re-certification Units (RU): Certificate for .3 RU's will be provided to ASQ Members attending plant tour. RU's are based on 1/10 of the hours. There is no webinar offered. The innovative, high-performance bonded cookware that All-Clad is known for is handcrafted in the USA by American artisans using American steel to provide superior cookware for the ultimate cooking performance. 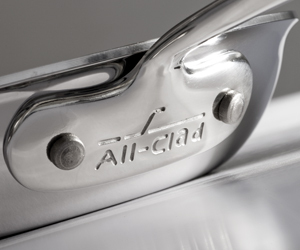 All-Clad’s Quest to Excellence began over 40 years ago knowing that the quality of raw materials are critical to performance. Couple this with hand crafted quality and the result is a beautifully finished bonded product that maintains optimal cooking performance, even after a lifetime of cooking enjoyment. All-Clad bonded cookware is manufactured in an environmentally friendly manner as virtually every ounce of unused material is recovered and recycled, including the metal dust generated during the sanding process. Some of the other environmental programs include utilizing recycled wash water, pH neutral soaps, reclaimed & recycled oils and reuse of plastic pallets. At each stage of the manufacturing process, every piece of All-Clad bonded cookware is hand-inspected to ensure that it maintains All-Clad’s rigorous quality standards. This dedication to quality ensures that every piece of cookware that leaves All-Clad is worthy of the reputation that precedes it - building customer loyalty. Our Quest to Excellence involves continual analysis and improvement to our business metrics such as safety incidents, water usage, rework, cycle time, scrap, customer calls and returns. In response to recent data analysis, some improvements that have been made include: Quality Specifications, Quality Audits, Safety Alerts, SOP’s and Skill Based Training.